The Schneider Optics 72mm HD Classic Soft 1/2 Filter imparts a closely confined, very subtle glow to highlights. If large amounts of overexposure exist in a scene, like a bright window, it produces a stylish glow that keeps the scene's contrast under control while adding a romantic look. This effect also blends small wrinkles and blemishes while maintaining an overall sharp focus that conceals the fact that a softening filter has been used. 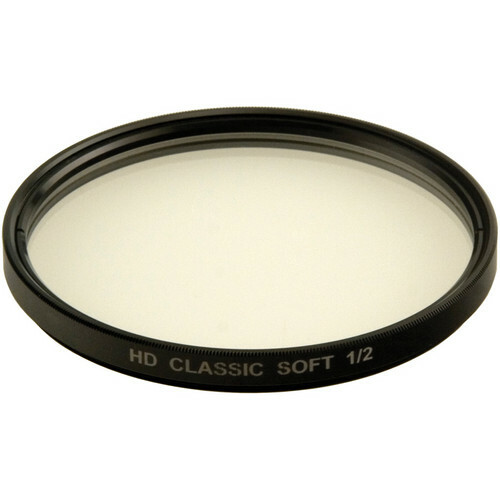 The filter is designed to allow shooting in all HD formats without the fear of artifacts. The strength of the filter achieves a very light to moderate diffusion. When used with a full frame sensor, the HD Classic Soft strength is engineered to be one grade lighter than its Classic Soft counterpart. This filter contains a carefully calculated amount of precisely positioned Micro-Lenslets. It provides a controlled soft image that is overlaid on a sharp, in-focus image, creating In-focus Diffusion.